School supplies collected by Dr. Joann Adeogun, an assistant professor of business at Reinhardt University, are headed to Kenya Oct. 17, 2015. Their destination is an orphanage run by Canton-based nonprofit SERV International. The 3461 items were donated by Reinhardt students, faculty and staff and included 1401 pencils, 224 pens, 600 crayons and markers, 163 pieces of chalk, 672 notebooks or paper items, 113 dictionaries and thesauruses, 243 erasers, and miscellaneous items like packs of rubber bands, rulers and pencil sharpeners. School supplies collected by Dr. Joann Adeogun, an assistant professor of business at Reinhardt University, are headed to Kenya Oct. 17, 2015. Their destination is an orphanage run by Canton-based nonprofit SERV International. The supply drive was her way of giving back. “It has nothing to do with any class,” she said. “It was just a project worth doing.” In all, 3461 items were donated by Reinhardt students, faculty and staff. Cathi Lindsey, SERV donor relations coordinator, expressed thanks for the donated supplies. Adeogun first learned about the orphanage this past spring when her international business class, and a project management class taught by business instructor Tina Boosel, worked with SERV. 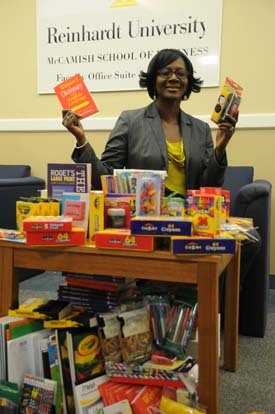 Adeogun felt called to do more, so she set up a school supply drive on Reinhardt’s Waleska campus this fall. Adeogun was inspired by the response. “I was definitely pleased,” she said. “As usual I got more than I expected, especially in such a short amount of time. We started in mid-August, and now it’s early October,” she said. The supplies will go to Kenya as part of a mission trip conducted by SERV. For more information on SERV, please visit their website: www.servone.org or call 770-516-1108. For more on Reinhardt, see Reinhardt.edu or call 770-720-5600.